If you want autographs from the actors in the films just follow my 'Guidelines. Don't think for one minute that just because of the enormous popularity of the films that they are harder to get. Research and determination will prove successful in virtually all cases. However, there is little point in writing to any of the agents of the stars involved. Here is a typical response from Robbie Coltrane's agents. Needless to say, I have removed all names from the letter. The enclosed photograph was a pre- printed signature naturally. 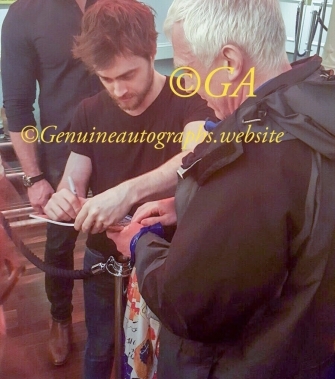 Top left - Daniel Radcliffe (Harry Potter) signing for me in the West End,London 2017. 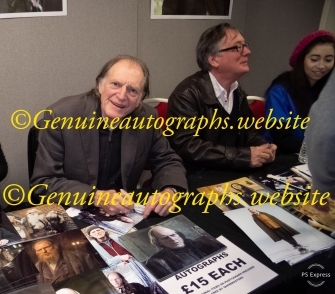 Top right - David Bradley (Argus Filch) signing for me at Collectormania 2012.
both signing for me at the Entertainment Media Show in London. Not every actor will appear at conventions, but certainly the majority will at some point. To my knowledge Dame Maggie Smith (Professor McGonagall) has never done so. Fortunately, I got her autograph in 1977 at Pinewood film studios. I would also be surprised if Daniel Radcliffe ever made an appearance at conventions as his career has certainly taken off, but he does appear in a number of plays so this will be the best chance of success. I have met him several times in London. 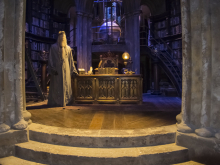 I am often asked if it is advisable to get the Harry Potter actors to sign one of the seven books rather than photographs, and I personally would not do so. Books can be highly collectable in their own right, especially first prints, and books signed by authors are definitely sought after. The author is signing their work just as an artist would sign a painting. To add the signature of an actor adds nothing, but can seriously affect the value of the book especially if the signatures overlap. Instead, if possible, get a photograph signed, preferably in costume for the role which made them famous. There are now a vast amount of 'Harry Potter' books appearing which were apparently signed by all the cast at film premieres. Whilst this may be possible it is extremely unlikely. The cast may perhaps sign for 10% of those attending, and they move around the barriers so all the fans can see them. Also, bear in mind a great deal of their time is spent doing interviews. The chances of obtaining autographs is greatly reduced in poor weather. I will leave you to decide for yourselves the chances of obtaining all the signatures of the main cast in a book. 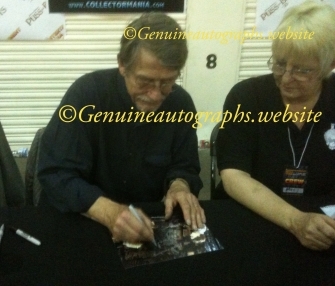 People often put photographs of the event with their listing in an attempt to authenticate the signatures but they have no relevance at all. They may indeed have taken the photographs, but this doesn't mean the signatures are genuine only that they were there, or they may have simply used a photograph already freely available on the internet. copy sold at auction in Dallas, 2017, for £60,000. J K Rowling is the ultimate success story. Once again there is little point in writing as any letter is dealt with by her PA (click HERE to see a typical response). In any event, you do not want her autograph on anything except one of her novels. 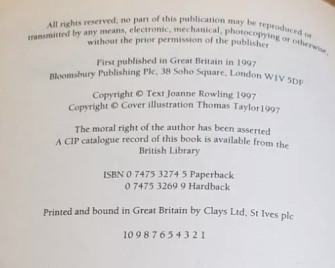 Do not buy any book allegedly signed by J K Rowling unless it is a first edition. All official signings took place on the books release and will be a first edition. Fraudsters maximise profit by using inexpensive books and trying to convince you they got it signed on a chance meeting. Why anyone would want to get a 'Ted Smart' edition signed for example, as opposed to the original Bloomsbury publications, is beyond me as it instantly loses significant value. I am extremely knowledgeable with regard to her signature and can tell a forgery instantly. This is due to the fact that I have met her several times, observed her writing style, and have many authentic signatures to compare with which have been signed at various stages in her career. J K Rowling is to be admired for the work she has done to authenticate her signature at official signings. 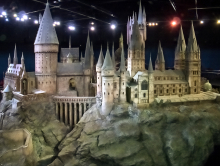 It started with the launch of 'The Deathly Hallows' at the moonlight signing held at the Natural History Museum. 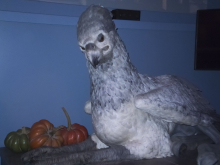 It was here that the idea of a hologram to authenticate the signature was developed. One of these books makes an excellent investment but expect to pay £1000- £1500 depending on condition and whether you get the additional items such as the ticket to the event and the 'goodie bag' containing everything from a poster to a balloon. Although the hologram is different, it is now present on all copies of 'The casual Vacancy' , and her Cormoran Strike novels (using the pseudonym Robert Galbraith) signed at official public events. Finally, just a quick note about ‘Harry Potter and the Cursed Child’. Although autographs from the cast will never reach the value of cast from the films they should not be ignored. However, you should definitely focus on the original cast only. 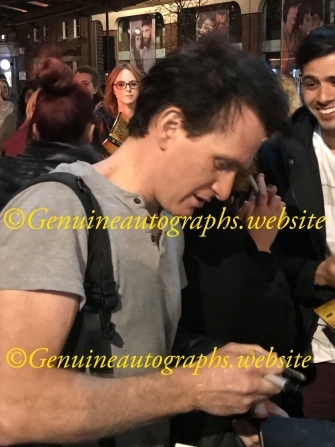 The original ‘Harry’ from the play signing for me outside ‘The Palace Theatre’, London 2017. He also launched the play on Broadway. Striking similarity with Daniel Radcliffe don’t you think?